Are you fade up with running out of hot water in the middle of a shower or while washing dishes? You’re at the right site to know which one is the best tankless water heater to solve your annoying issue. The traditional water heater entails a lot of maintenance work and doesn’t function as effective as the tankless water heater. For this reason, many people are embracing the tankless water system as it does not only last long but as well enable you save on your utility bills. If you want to have endless hot water in your home, look for the quality tankless water heaters to start benefiting from it. This brings us to the questions many people have been asking; How to find the best tankless water heater? This question sounds tricky but it’s not. Many people get confused by the various models and types of tankless water heaters in the market when it comes to choosing the best. First, you’ve to know how to differentiate between water heaters so that you can choose one the best suits your house system and needs. With regard to the area you live in, you can either select an electricity powered, gas powered or propane powered tankless water heater. Also, you can choose one with a gallon per minute flow that matches the needs of your home. If you stay in very cold areas, one with a higher gallon per minute is ideal. This type of water heating comes with many advantages when compared to the traditional type as we will learn further below. Installing it is very easy as it doesn’t consume much space like the traditional water heater with a tank. In this guide and review, we’ve clearly explained various points that will enable you make a well calculated and viable decision in choosing a tankless heater of your choice. Read further to understand better. They occupy very little space when compared to traditional water heaters. This is because they don’t come with tanks and are compactly designed to take up very little space. This type of water heater is highly efficient and will enable you save a lot on your energy bills. The tankless heater is shut off when not in use unlike the traditional water heater where it uses power all the time to keep the water warm and ready for use. Though the initial cost of acquiring a tankless water heater is on the high, it last longer than the traditional water heater with a lifespan of around 20 years while that of its counterpart is 13 years. If you use a tankless heater, you will never run out of hot water as long as you don’t go beyond the recommended capacity. Size – days are gone where you required enough space to install a traditional water heater with a big tank. The tankless water heaters are very compact with some measuring to a size of a briefcase. These are very simple to install and can fit easily in various areas in your home. As well, look for a size that will heat your water well. Related: Want to drink healthy water then use reverse osmosis system. Energy source – there are three main energy sources used to power a tankless heater. These include; gas, propane, and electricity. Depending on the area that you live in, you may need a tankless heater this is powered by one of the three sources. If you live in extreme cold temperatures like in the northern part of U.S and Canada, you will need a gas powered tankless heater as it’s more powerful. For those who live in the south or at least not very cold regions can use an electric powered tankless water heater. Always get the right tankless heater that is compatible with the power source in your house be t gas, propane or electricity. Efficiency – consider choosing a very efficient water heater so that you can save on the cost of electricity or gas bills. The tankless water heater is very energy efficient and will save on your costs a great deal. This is because it can be powered off when not in use. Reliability – these water heaters are very reliable as they have low maintenance costs in case a problem emanates. In addition, they are very easy to repair and will only costs a few bucks in such scenarios. As well, they assure you of warm or hot water throughout unlike the traditional water heater. Environmentally friendly – since these devices are on stand-by mode all the time, they utilize very little energy which is a great thing for the environment. The electric models are regarded as 100% eco-friendly. Pick a model that is very eco-friendly. Gallon per minute – as you look for the best tankless water heater for your home, consider checking out the gallon per minute that it is able to offer. Gallon per minute is the amount of water your unit can heat. Most of the devices come with a gallon per minute that ranges between 0.3 gpm to 0.9 gpm. If you live in very cold areas, you need a device with a higher gpm such as 0.6 and above. Another thing to note is that when your water pressure surpasses the gallon per minute indicated, the temperature of the water will start to fall. Related: To get pure water you have to buy water softener system. 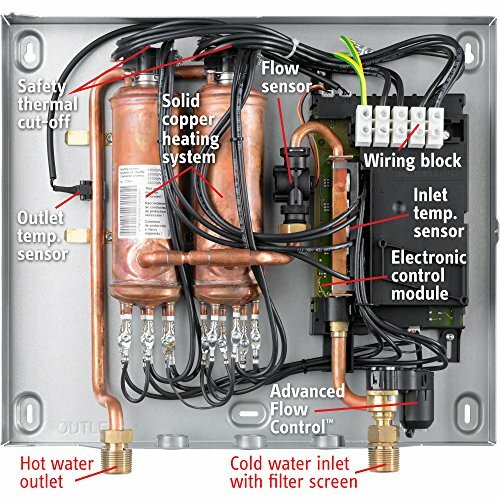 Flow activation – each and every tankless heater functions by electronically measuring the flow of the water. This means that if the water flows quickly, the temperature of the water will reduce drastically and if it flows slowly, the temperature will rise. Thus, you should always use the recommended flow rate of water to ensure you get a certain level of hot water. Clean and safe – one of the greatest advantages of using tankless water heaters is that they are very safe and clean as they don’t build up rust like traditional tanks do. Thus, they ensure that you receive clean and fresh water to use in the house for different activities. Capacity – consider the capacity of a water heater before buying one. You should ensure it meets all your warm water needs at home such as washing dishes, showering or even washing. 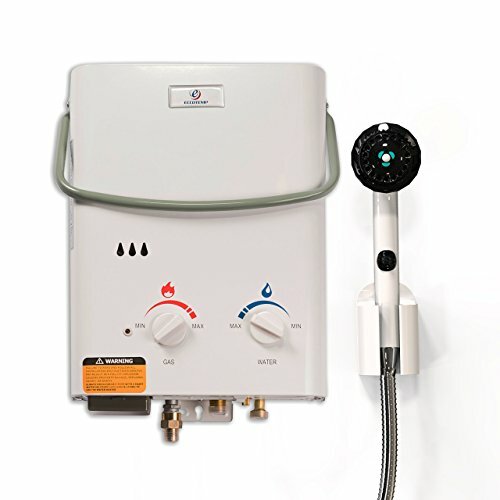 Portability – if you want a water heater to travel with is as well available. These are powered by batteries which are mostly rechargeable. Look for a lightweight and compact design so that you can carry it with much ease as you go camping or hiking. Temperature range – most of the devices come with temperature ranges indicated on it for various uses. Make sure the temperatures indicated meet all your different water uses. Warranty – does the device you are opting to purchase have a warranty? Not all products are high quality and even so, you need a warranty to be fully secure in case the tankless water heater comes with a defect or requires the attention of a specialist. Ensure you buy from the best tankless water heater brand which normally offer quality products with warranties. Related: Find here the most popular water flosser list. Price – price shouldn’t be a big determine of the device you choose. Electric tankless water heaters are the cheapest while those powered by gas are the most expensive. Depending on your location, select a water heater that will perform well without letting you down in the hour of need. Choose a gas or propane operated tankless water heater if you stay in cold areas. Searching for the best tankless water heater has never been easy. You need to know what to consider so that you avoid ending up with a poor or less effective heater in your home. Now that we’ve informed you on the important aspects to look at when searching for the top rated tankless heater, you can easily select one that you feel meets your needs. The list below comprises of our five best tankless water heater that have proven to offer excellent results over the years. This is one of the best eco-friendly heater on the market and it has high ratings on several selling sites. The EcoSmart ECO 27 electric tankless water heater comes with quality features that make heating your water to be very easy and convenient. It is made up of both copper and stainless steel parts making it to be highly durable and stand against the test of time. The digital temperature control allows the user easily change the temperature with regards to their needs. Also, this device is compact in size making it very easy to install. With its high energy efficiency rate, get this heater today and receive constant hot water in your home for different applications. 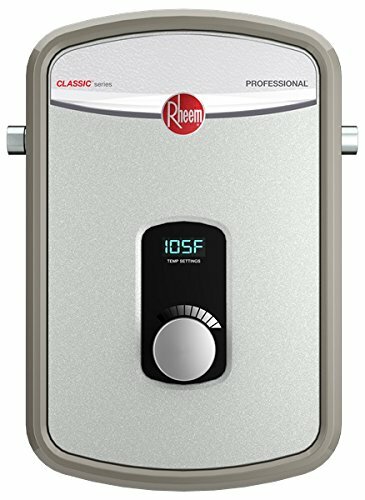 Rheem RTE9 electric tankless heater is an excellently designed unit with wonderful features. The heater is strongly built with rugged brass/copper heat exchanger that ensures the device is secured and installed well. 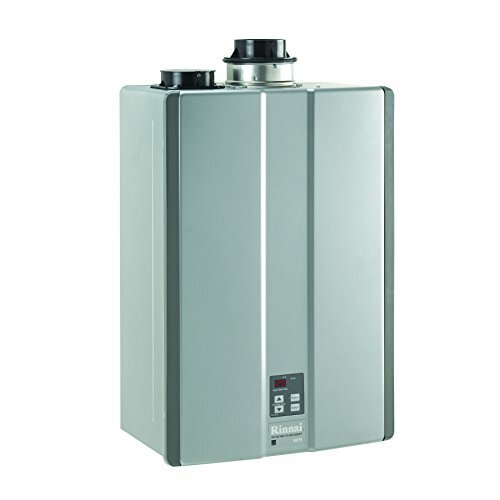 This powerful and reliable best tankless water heater is able to heat water at a rate of 3 gallon per minute. It is very easy to operate with an On-unit temperature control that enables the user to adjust the temperature according to needs. It can be used for various home needs such as bathing or even washing dishes. If you’re tired of running out of hot water, acquire this device for endless warm water in your residence. If you are a camper or hiker or traveler looking for a portable and excellent tankless water heater, the Eccotemp L5 portable water heater is the best choice for you. This potable device is lightweight and great for carrying as you go camping. It is also compact and it’s great to travel with wherever you’re going. When on a trip, you can use 2 D cell battery ignition to power the device. But for indoors, it uses liquid propane which is a very reliable and strong source of power. With a one year limited warranty from the manufacturer, buy this tankless heater today and constantly receive hot water wherever you go to. This is one of the simple looking but versatile tankless water heater that performs outstandingly in offering hot water for your entire household. This excellently designed unit is powered by propane or natural gas which is stronger than electricity and ideal for use in cold regions such as in the northern American. It as well comes with a simple control unit for adjusting the temperature as required. Other great features include; maximum of 96 energy factor and ultra low NOx emissions. Purchase this gadget today and lower your utility bills by almost or more than half. It is highly reliable for use in very cold environments as it utilizes natural gas as its source of power. For those interested in highly advanced tankless water heater models, the Stiebel Eltron Tempra 24 is the device to opt for. As sleek as it appears, this device will help its user save on the electricity bill previously experienced with the traditional design and at the same time increase efficiency and convenience. Thus, it is called the best tankless water heater electric. In addition, it comes with a digital temperature control that enables the user to change the temperature of the water with regard to the needs. If you’ve been looking for a constant flow of hot water at a great rate, acquire this device and you will have a new experience in your home. The discovery of the tankless water heater has brought a new way through which water is warmed for use. The traditional system was very unreliable as hot water could get finished before you are done with your chores. This system is very effective in that you can use it whenever you want to, leading to lower electricity or gas costs but with increased efficiency. The best tankless water heater 8-34% more efficient than normal heater. You just need to comprehend a few elements before you go out there searching for your next unit. 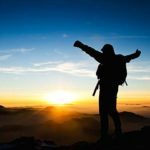 In this review, we’ve expounded on all the factors you require looking at before deciding to acquire a unit of your choice. Do your homework very well and choose from our top five list above or use our information to land a great tankless water heater of your choice. 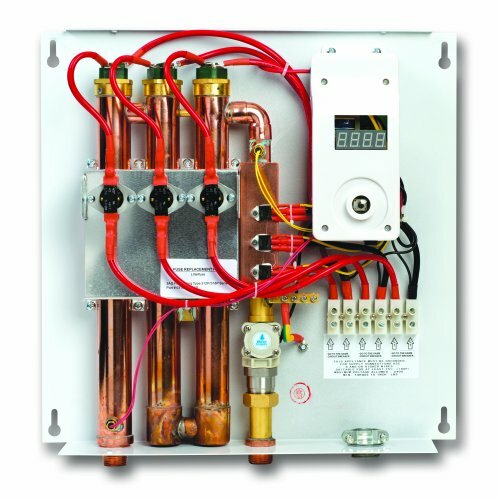 Still, have a question after reading this Best Tankless Water Heater? Comment below.